Labyrinths are believed to focus the mind and body. Labyrinths have been walked for centuries as a physical path to spiritual enlightenment and peace. Public labyrinths, both old and new, are found worldwide in churches, hospitals and recreational areas. They are peaceful pathways to stroll for inward focus if not beauty. Their health benefits have been studied. They can be elaborate or simple for home use. They can be a DIY (do-it-yourself) project or can be created by landscape artists and garden companies. A labyrinth has a single path without intersections or dead ends, unlike a maze. The path leads to the center. The famous Chartres labyrinth has 28 180-degree turns and 112 lunation circles. A home modification can be drawn or purchased on canvas 12 feet in diameter, allowing 12 full turns. Smaller ones are possible, as are larger. The analogy is following life’s paths eventually leads to a core (or God) of life. a raised path with water boundaries creates a unique labyrinth landscape. See the initial labyrinth template in photos 1 and 2 to begin. There will be expanding circles from the center wide enough for at least a narrow walking path. Mark a center and determine how many circuits (paths) will be used to get there. This example will be for seven paths each side. Modify as desired. Eight lines (of the chosen object) will be used to create seven paths. Each expands beyond the previous. Extend the outer five lines three quarters of the way to a complete circle. Connect the right side center semicircle line to the third line. Connect the left line to the second line. Make a straight centerline to the bottom of the labyrinth with a horizontal line connecting lines three on bottom to each other. Finish by connecting the bottom line with the two above it. Remember the lines work the borders of the path; they are not the path itself, which can be made of grass, granite concrete, mulch, artificial turf, pebbles, sand ground cover, or meadows of tall grass can be mowed to create paths eliminating the need to create borders, but necessitating maintenance by weekly mowing. Homes without space or those unable to walk a path can still enjoy the labyrinth experience. Small labyrinths can be walked with fingers or the mind to reach the center employing the same focus and achieving similar serenity. Finger labyrinths make nice gifts for the homebound or hospitalized as well. 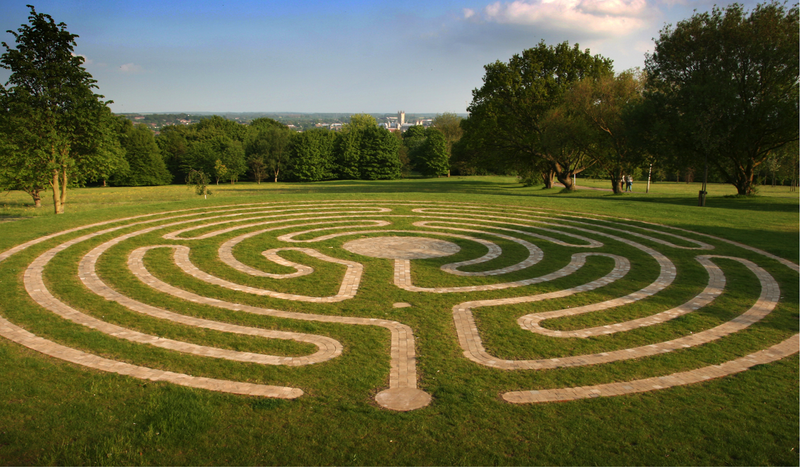 Read also Find the Labyrinth for Self Healing, Wellness and Reduce Stress to locate and learn more about labyrinths, personal or otherwise, as a way to promote well-being and health.